Stormwater runoff from construction activities is regulated because it can have a significant impact on water quality by contributing sediment and other pollutants to streams, ponds, lakes, etc. 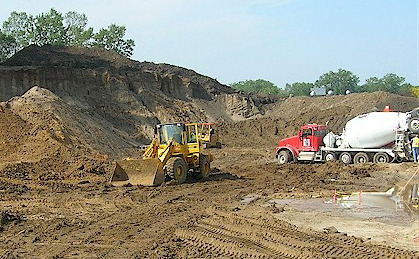 Disturbance includes, but is not limited to soil disturbance, clearing, grading, and excavation. Operators of sites disturbing less than one acre are also required to obtain a permit if their activity is part of a "larger common plan of development or sale" with a planned disturbance of one acre or greater. Develop, submit, and implement an erosion and sediment control plan prior to initiating any on-site activities. This plan specifies the measures that will be put in place to prevent and/or control erosion and sediment run-off. In addition to these statewide rules, you may be required to meet additional local stormwater and erosion control regulations. Check with your city or county government to determine if additional local rules apply to your construction project.